Bramell, Party of Five: Just for Pop! This picture is for my dad, who just called us. 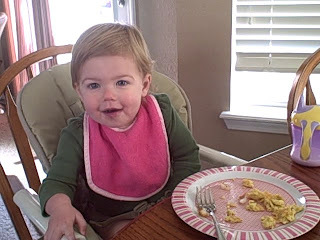 It's Becca having her favorite breakfast--scrambled eggs and hashbrowns. Dad kindly pointed out that we haven't posted any new pictures of the baby lately. Ice storm, yeah but Becca, no. Thanks, Dad. You are just as bad as the women who read the blog! Oh my goodness! She is getting so big. I am glad that you all survived the ice storm. There are still alot of my friends up there with no power. You guys are lucky. Keep posting new pics of our book worm. love you guys! Raise your hand if you have cabin fever! !